Made to fit around the neck of a bottle, a Drip Stopper may be formed into a single piece or two pieces that keep excess liquid from being spilled as the beverage is poured. Some Drip Stoppers are constructed of elastic materials that can expand to be placed around the top of a bottle and snugged into position as the material contracts to fit snuggly around the neck of the bottle. 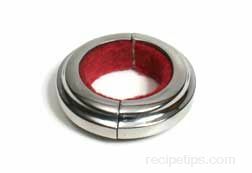 Drip Stoppers may also be made as two half circles with magnets so the pieces can be placed around the neck and retained in position by the magnets within the Drip Stopper.